Venison Is Like Goat, Right? This weekend was a surprisingly successful deer hunting trip to the great brown north of Minnesota. After sitting for the morning on opening day, I was not expecting to see any deer all weekend. I was pleasantly proven wrong when two fawns walked into sight and hung out long enough to be gutted and dragged out of the woods. In years past, we've spend the week after deer opener processing meat and freezing it for long-term storage. This has always included removing all the fat and as much of the silver skin as possible prior to freezing. This year, we decided to try timeshifting some of that processing by freezing large pieces of less-processed meat that we'll finish processing when we thaw it out to cook. We're hoping that what this lacks in convenience later will be made up with a lack of frustration now. I also decided to try another project. I heard about Mocetta last winter from JCC at You Have To Cook It Right. He used the recipe from Hank Shaw at Hunter Angler Gardner Cook after he roasted a whole goat for Frustrated Farmer Rick's fall farm festival at Caerwyn Farm and Spirits. 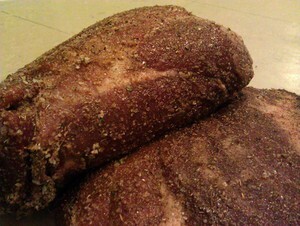 The original Mocetta is a Northern Italian, cured, spiced, air-dried goat leg. Now...I don't have any goats, but I figured that venison leg would be a reasonable substitution. After cutting up two of the hind legs for roasts and the front legs for burger and sausage (I'm going to try another of Hank's Recipes there) I set aside two of the legs, hopped on my motorcycles and headed over to Penzey's Spices to get some juniper berries. Making the rub was simple enough; Hank's recipe made exactly 1 pound, so splitting it up into two parts was simple. After half an hour of preparation, the hams are sitting in a plastic tub in the refrigerator and I'm waiting not very patiently for the first two weeks to pass and the second application of rub. Giada De Laurentiis is difficult for me to watch. It may be the way they're trying to make her show the American version of Nigella Bites. I think she could be a good host if her show wasn't trying to be so artsy. Also, her head looks huge to me. Anyway, I watched her Everyday Italian show a while ago and was pleasantly surprised to find that her recipes are pretty dang good. The show I watched was Italian Comfort Food and one of the recipes was Turkey Osso Buco. She said that the original dish was Veal Osso Buco, but turkey worked great too. The basic idea is to brown the meat on the stovetop, sweat a trinity mix in the same pan, then braise the meat for two hours in the oven with the trinity, some fresh herbs, white wine wine and chicken stock. The first time I made it was with chicken and it turned out great. The legs had no tendons left because they were all cooked to yummy gelatin. I'd skin the chicken next time because it seemed to get an odd texture in the long cooking. It probably made the sauce much better though. Venison is a meat, like squid, that is best cooked in one of two ways: hot and fast, or low and slow. So the second time I made osso buco was with venison, red wine and beef stock. It worked out great. Lots of flavor, tender meat like a brisket. Good stuff. I guess I'll have to see if I can watch Giada for more than a few minutes at a time because this is now a staple dish for me.